Under Colorado law, drivers who injure someone walking or biking often get the same slap on the wrist as drivers who clip a car’s mirror. The charge is called “careless driving” and it carries four points on a driver’s license. It takes 12 points to lose driving privileges, so someone can hit a person, causing life-altering injuries like the loss of a limb or permanent brain damage, and get back behind the wheel the very next day. 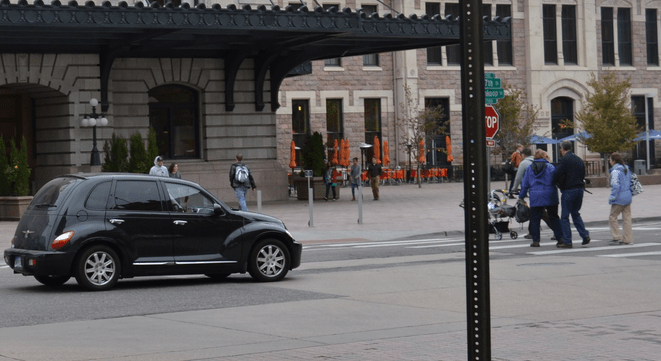 If you think people’s lives should be a higher priority under the law, you should sign Bicycle Colorado’s new online petition calling for tougher consequences when a driver harms a person. Lots of us know what it’s like to survive a run-in with a car. It’s downright scary. And if you get hit, well, the law isn’t always on your side. In Colorado, a driver convicted of seriously injuring a child or adult is typically able to walk out of court and keep on driving. One piece of legislation being considered by Representative Mike Foote, a Democrat from Lafayette, would add more points to the licenses of careless drivers who hit people. So sign Bicycle Colorado’s petition if you think lawmakers should value human beings more than they value cars.